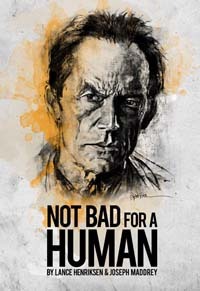 Don't forget: Lance Henriksen and co-author Joseph Maddrey (along with Steve Niles, Mike Mignola and Bill Sienkiewicz) will be signing copies of the new Henriksen bio, Not Bad for a Human, tonight at 7:30 pm, PST. The location is Dark Delicacies. Don't miss out! I got my camera in hand and my enthusiasm set to high. This will be great, I know it. Thanks, John.